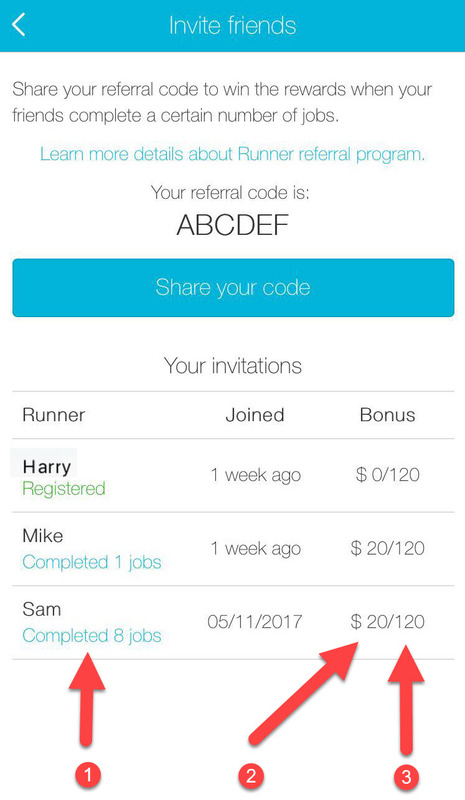 After hearing that a lot of Runners heard about Go People from their friends, we decided to implement a Runner invitation program. Then, invite your friends by simply entering your friend’s contact details. 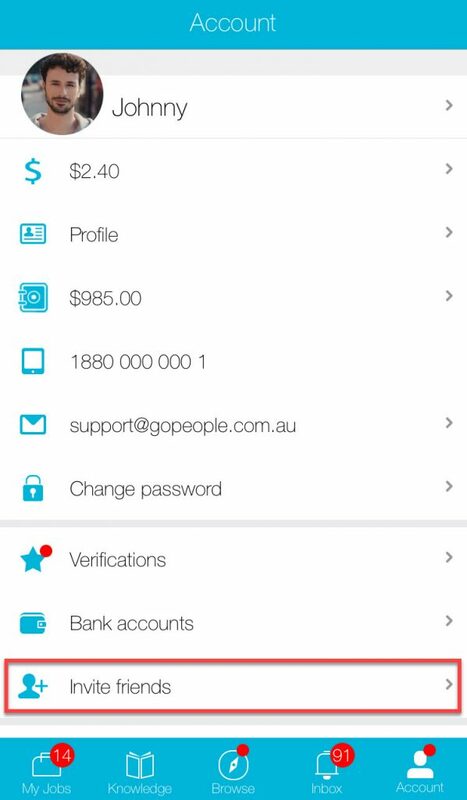 You can send them an invite code via email, SMS or another messaging App. Or, if you want, have them manually enter the invite code into their App. 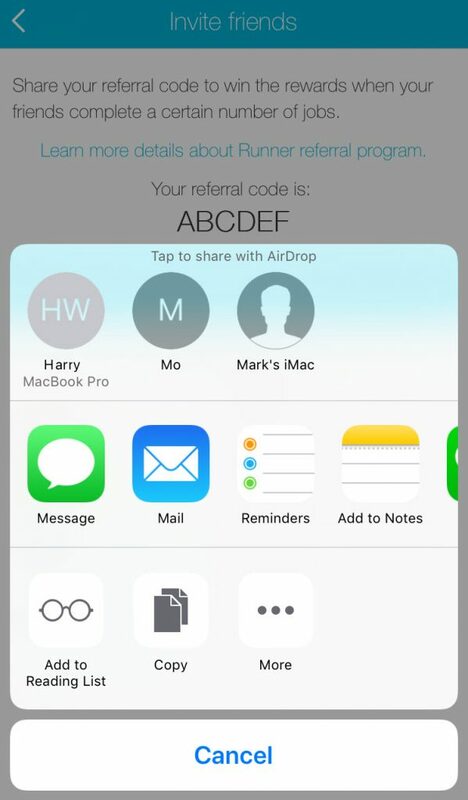 Your friend will then receive an referral code, which they’ll use to link your account to their account. Then, after your friend has certain amount of deliveries, you will receive a little bonus for referring them! In the example above, there are 3 Runners: Harry, Mike and Sam. Their status is shown underneath their names. Harry has only registered, while Mike and Sam have completed some jobs. On the right hand side, you can see that Mike and Sam have different money amounts next to their name. This shows how much they’ve earnt their friend from working. Mike and Sam have each earnt their friend $20. The ‘120’ to the right of that number indicates the total amount that can be earnt. There are different awards paid out per state; you will receive the award if the Runner you have referred is from that state. So, if you’re in Western Australia and have referred someone who will work in New South Wales, you will receive the NSW award. NOTE: The Runner Referral program is only active to users in New South Wales at the moment (4 December 2017). Can my friends use my account to do jobs? No, your friends will have to make their own account, and pass the Runner induction successfully by themselves. Can I use my friends account to do the jobs? No, you certainly cannot. It would be a breach in our Terms & Conditions, and you would face the risk of getting both of your accounts suspended. My friend has done enough jobs, but 1 of them was disputed. Will I still get my money? No, to earn your referral money your friend will have to complete the set amount of jobs without a dispute. Does “jobs” mean single on-demand jobs, or does it also include a Shift of 10 jobs? Jobs can mean 10 single On-Demand jobs, a Shift of 10 jobs, or a combination of the two. Can I link my friend after he/she registered without a referral code? Only within 24 hours of your friend registering. You must also send the support team an email in this case.